The Abbey, almost a century belatedly, premieres Shaw’s popular masterpiece in a sparkling production. 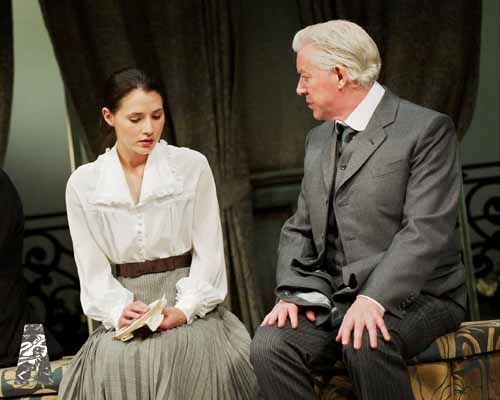 Pygmalion, or My Fair Lady without the music as some people will insist on regarding it, sees arrogant Professor of Phonetics Henry Higgins take in hand a flower-girl who comes to him for elocution lessons after he’s alarmed her by transcribing her dialect in Covent Garden. He will do much more than change her screeching Cockerney accent into serviceable shop girl King’s English though, as, to win a bet with fellow phonetician Colonel Pickering, he undertakes to transform Eliza Doolittle into an imitation Duchess within six months and pass her off at a Royal Ball as such. Director Annabelle Comyn’s oddly revealing staging of the bathroom scene emphasises that Higgins really is stripping Eliza not just of her accent, but her station in life; and even personality; and irresponsibly remaking her to his own whims. Charlie Murphy, who impressed in Kenneth Lonergan’s three-hander This Is Our Youth at the Project in 2009, makes a wonderful Eliza Doolittle. Her physical transformation from filthy flower-girl to elegant faux-duchess is archetypal, while vocally her transition from East End to RP tones is impeccable and includes a coldness to Higgins in their final scenes that captures the accompanying intellectual transformation he had not counted on. Nick Dunning, who Fassbendered his way across the Abbey stage in summer 2009 as Sir Anthony Absolute in The Rivals, enjoys himself greatly as the mild-mannered Colonel Pickering. He’s outdone though by Risteard Cooper who whoops it up as Henry Higgins, adopting an almost permanent squint and crouching impetuousness to convey a man intellectually so above his company as to be permanently impatient with their opinions and manners. Pygmalion continues its run at the Abbey until the 11th of June.